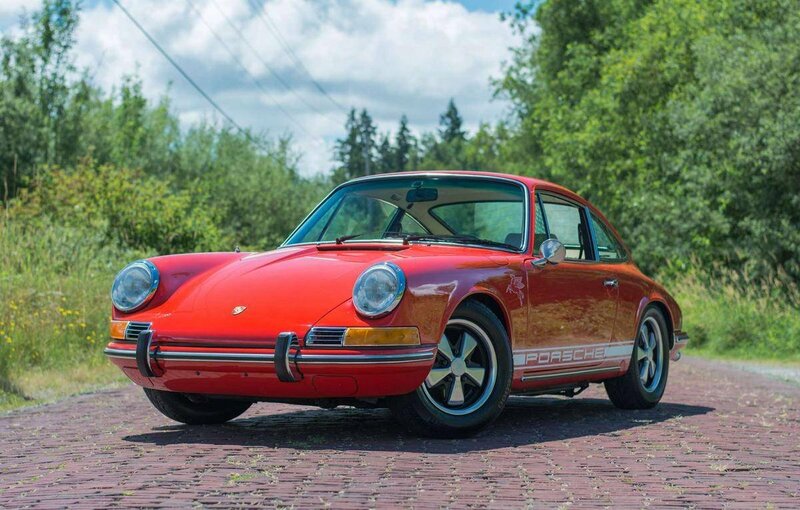 1970 Porsche 911 T = US-specs. 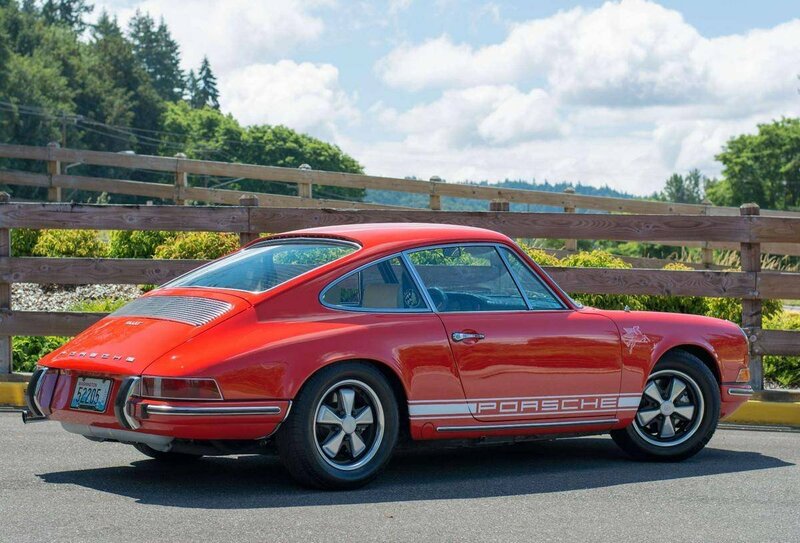 - A clean driver Local WA state 2-owner Bahia Red 911 long nose. Extensive documentation, upgraded 2.4L motor. The Porsche 911 is one of the most iconic and recognizable automotive designs of the 20th century. From the legendary 2.7 RS to the early 2.0 901, the 911 quickly gained a reputation for it's unique looks and remarkable performance while still maintaining daily usability. 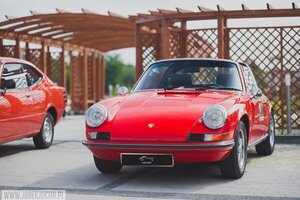 Though safety standards and emissions rapidly closed in, the 64-73 911s escaped the factory in the purist form. These are the long nose cars. Before you needed rubber bumpers or catalytic converters or water-cooling, these early 911s offered undiluted experiences, as Ferdinand Porsche would've wanted. Between 64 and 73, the long nose cars saw several updates, starting at 2.0L, then 2.2L, then 2.4L and eventually 2.7L with the 2.7 RS. 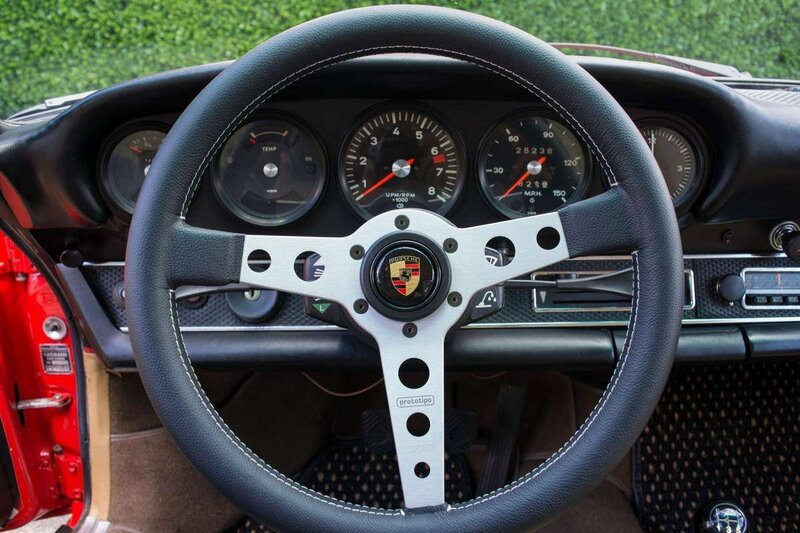 A faithful successor to the 356, these early 911s showed great success in all sorts of racing. From SCCA to IMSA, Targa Florio to IROC, early 911s dominated the racetrack with their low drag and high reliability. - What we have here is a fantastically documented example of an early 911T. 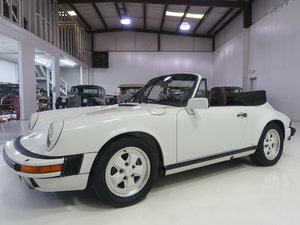 The current owner purchased this car in 2015 from the first owner, who purchased it new from De Maria Porsche/Audi in Coral Gables, Florida on November 26, 1969. He moved to Washington in 1970, bringing the car with him. Throughout its life, he meticulously maintained it making sure that at the slightest sound he took it in to a mechanic. - Full records and documents are present for tons of work done throughout his years of ownership. Even the original Florida and Washington registrations are included. 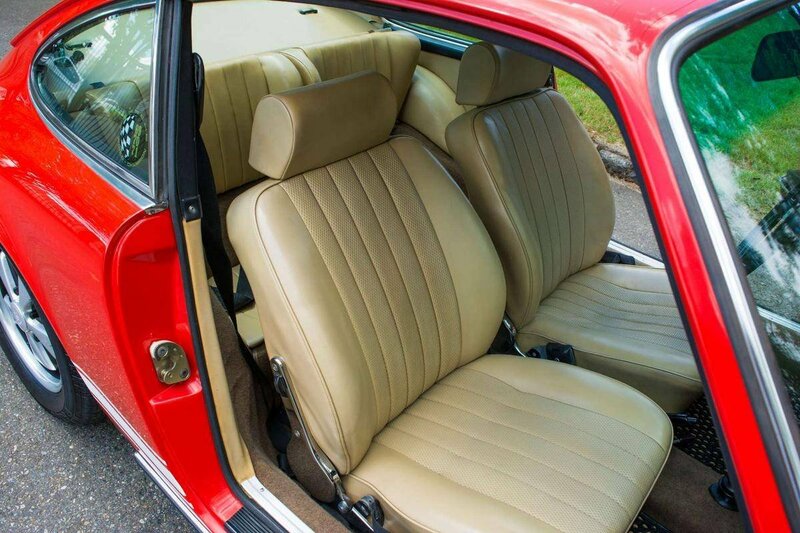 It maintains a great degree of originality throughout, with the full original interior still intact and in good shape. All electrics are in good working order. - The original Blaupunkt Frankfurt radio and Hirschmann power antenna both function well. The dash is in very good shape as is all seating areas and door panels. - The dark brown Perlon carpets are in great condition and the car has brand new coco floor mats, which really liven up the interior vibe. Up front the car has twin 6volt batteries, spare wheel, original tool kit, and a jack. - All the original side and rear glass is in excellent condition; the windshield is a new replacement. - It was equipped with the optional 5-speed from the factory, which is still in place. - The car is presented in its original color combo of Bahia Red over Beige leatherette, having received one complete respray in its life span during the early 1980s in the original color. - The odometer shows 26,000, actual mileage is believed to be 126,000 as documented through the service records. - The original owner’s manual, radio manual, maintenance record book, vinyl folio, and 3 red factory keys are present with the car. - In 1985, the first owner replaced the 2.2L motor with a T-spec 2.4L motor ordered direct from West Germany and air freighted over via Lufthansa cargo. As such, the car is not numbers matching but it was a worthwhile upgrade, as it performs much better than original. - More recently, the current owner has had the correct date-coded Fuchs professionally refinished, a Momo Prototipo steering wheel was added (the original is included), lowered ride height, Koni Classic red shock absorbers, Pirelli P6000 tires, and front and rear sway bars were also installed. - Another noteworthy upgrade are Hella H4 headlamps, a welcome addition for night time visibility. Recent servicing includes; new brake pads, all 4 calipers rebuilt, all fluids changed, new oil lines, fresh valve adjustment, new twin 6V batteries, distributor cap, rotor, spark plugs and wires replaced. Both front tie rods have been replaced, a fresh 4-wheel alignment has been performed, and the carburetors were just rebuilt. - All this work helps to make this 911T very reliable, fun, and daily drivable. The clutch operation is good and the transmission shifts smoothly and easily in all gears. 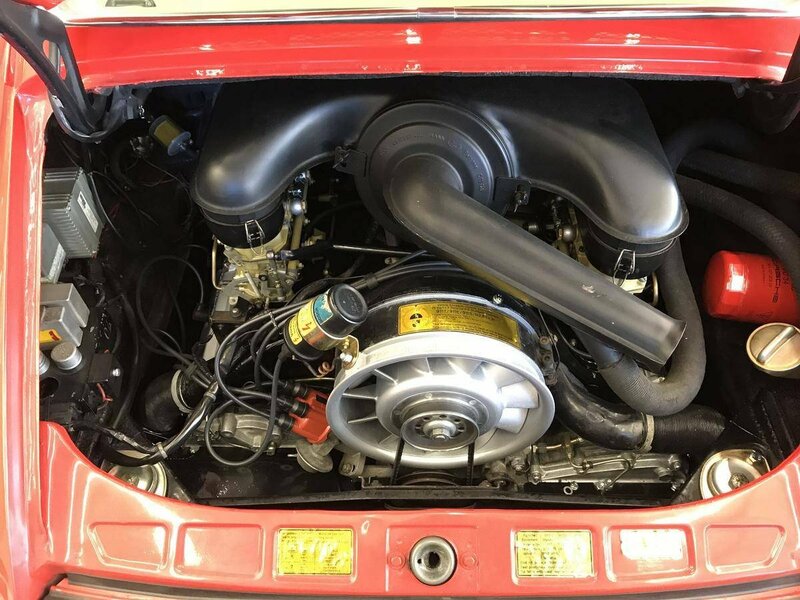 - If you are looking for an early 911 that you won't be afraid to put some miles on, this would be a fantastic addition to your stable. 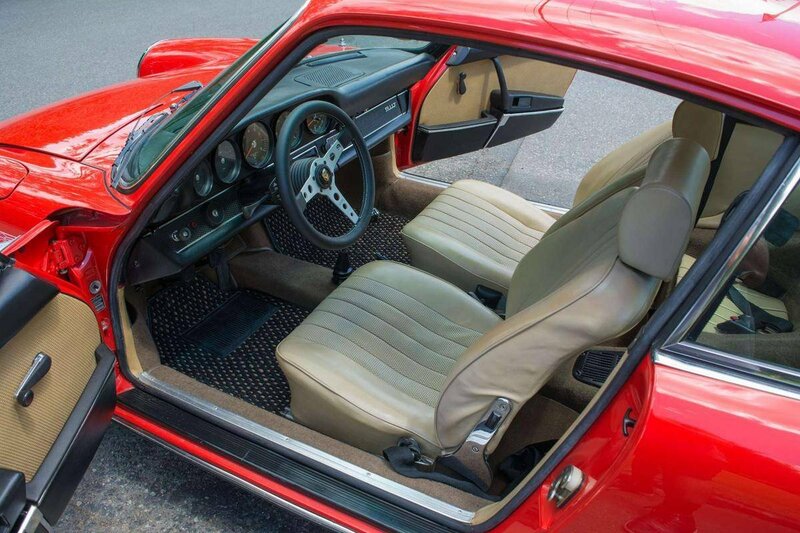 - This is one of the best documented early 911s on the market and it is ready for a third owner to enjoy the next chapters of its life ahead.